A traditional classically style Winchester high level toilet bathroom suite, perfect for providing a period look in any home. 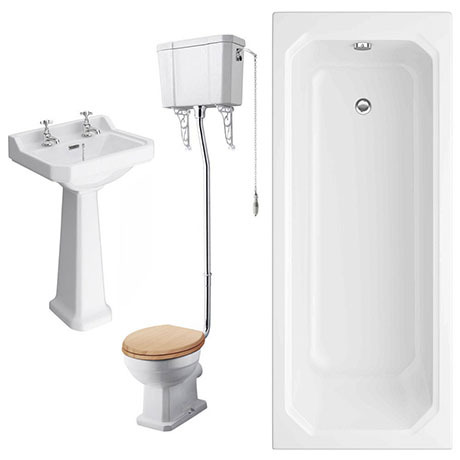 Toilet comes with a polished chrome traditional high level flush pipe pack which includes a high level flush pipe, fulcrum lever, chain pull and ornate cistern support brackets. Built from a vitreous china, this traditional toilet has a design inspired by Victorian and Edwardian eras. The traditional basin is built from a vitreous china comes with a full Pedestal, ideal for hiding unsightly pipework. The classically styled Art Deco Single Ended Acrylic Bath, manufactured from high grade acrylic making the bathtub incredibly strong and hard-wearing. The bathtub comes with a pre-drilled waste and overflow holes, and also includes a set of bath legs. Bath tub is guaranteed for 5 years for total reassurance. Basin has over flow and chain stay hole.